This mouse shall learn a lesson! Lately, Creamsicle has taken to joining us for meals and some petting. She is very insistent, and will let you know with headbutting that ignoring her is not an option. 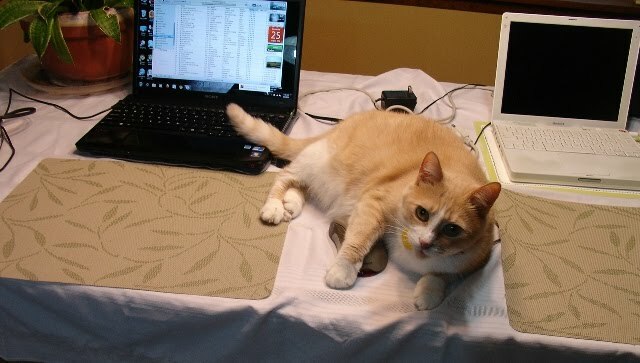 One morning last week, however, she decided that it was time to take on the mouse. 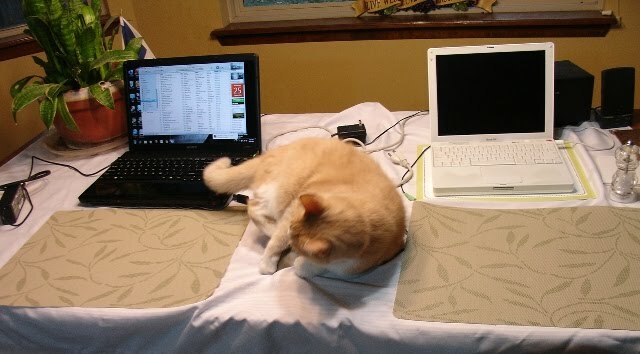 Most mornings, we have two computers out and open on the kitchen table, the one on the left being the newer one, with an actual (computer) mouse attached. Take that! You shall remember the fearsome name Creamsicle! She attacked for all she was worth, as if it was a real mouse to be disemboweled. Some of you may remember what she can do to a stuffed mouse. Luckily, the computer mouse seemed to be made of sterner stuff than the felt mouse. What? It was asking for it! And surely you wanted iTunes open, so I opened it for you. She didn't do any real damage, but she did open a few programs and reconfigure the desktop... Oh Creamy. Why don't you go play with Miikka instead? 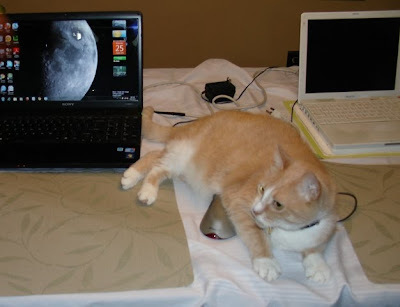 It would get less cat hair on the table. They do play, by the way. Miikka dances around her, barking, and she lays on the floor, taking occasional swipes at him and hissing. When she is done playing, she goes over to a hatbox that is in the living room. Once she is on the box, Miikka knows to leave her alone. Don't know how she taught him that, but it seems to work. Today I Love . 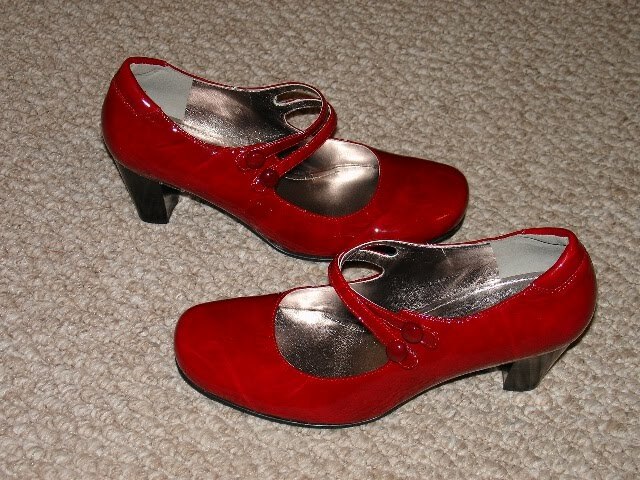 . .
My new red shoes. I am usually not at all interested in footwear. It is a necessary evil that I have to put up with, something my feet wish didn't exists. So, apart from a good pair of hiking boots, I don't tend to have any shoe-related fantasies or desires. But recently, I have been pining after a pair of red shoes. Preferably shiny ones. I am not sure how or why this obsession developed, but it certainly bit me hard. 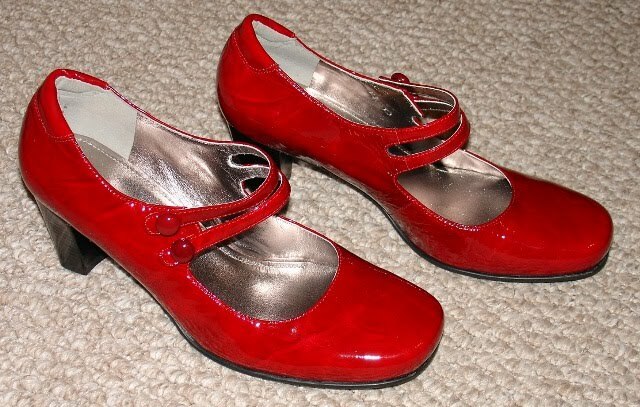 This weekend, I got a chance to go shopping with a couple of friends, and they must have been my good luck charms, because I found a great pair of patent leather red shoes, very similar to a $240 pair I had been drooling over online, for the sale price of $47. So now I feel like Dorothy - if only clicking the heels got me out of work and back home! Wow, it is Friday again already. Not that this week has been particularly eventful, but it has gone by somewhat quicker than I expected. The weather is finally cooling off some, so we have been able to go on walks. I got a new workout from my personal trainer, so my shoulders are sore as I adjust to new exercises. School started for Benjamin this week. I finished a really good book, The Case for God by Karen Armstrong. It is a sort of history of religion and the way God has been conceived and understood over the millennia. Long and dense, but full of interesting insights that made me pull out a pencil and start underlining. I also went Aha! a few times. And now for the weekend: I have plans to go shopping with a couple of friends, and maybe do some yard work while it is cool. Yay! Otherwise, I suspect there will be more walks, and some food eaten. I will try to have some new pictures next week. 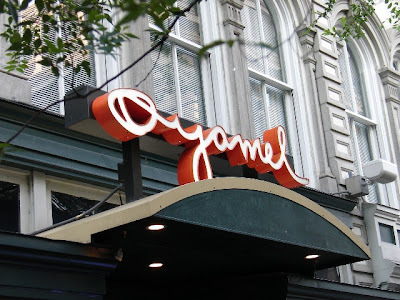 We always joke that Creamsicle has a whiskey and cigarette voice. This morning, she had the smell to go with it. When I let her out on to the deck during breakfast, there was a lot of smoke in the air from a wildfire nearby (I am speculating, since there have been several in the past month). When she came back in, she smelled like the smoke. As Benjamin said, "Well, you know Creamsicle." Fall here is still at least several weeks away, but it is coming. The early morning smells much more autumnal than it did a month ago. The light slants in at a steeper angle and the sun rises later. Now, if only the temperature would follow suit. 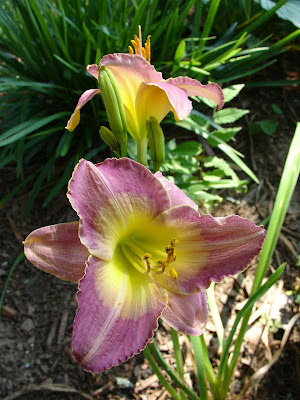 Since nothing much has been happening around here for the last month, here are some random pictures from earlier in the summer, before the yard had been overcome by heat and lack of rain, and before we lost our will to hike and go outside. 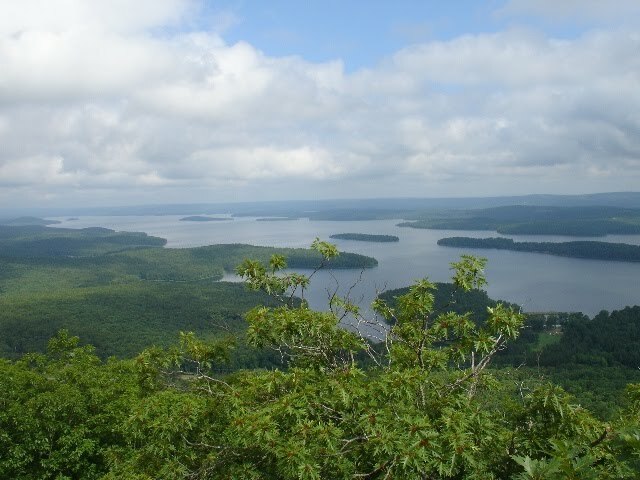 Pinnacle Mountain, the last time we went hiking, in June. The view from the top, if you survive that long. 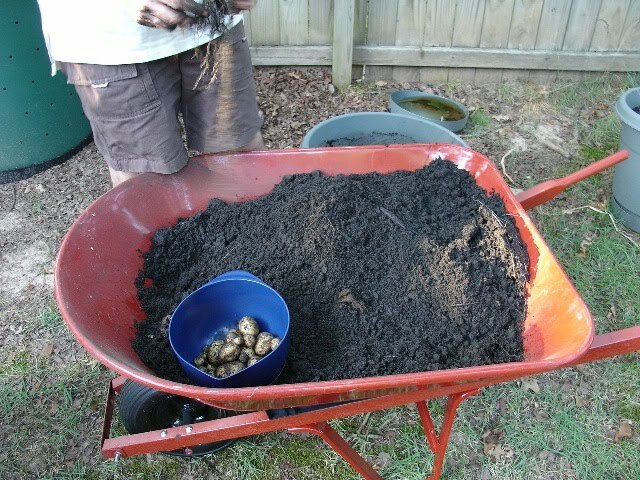 Our meager crop of Yukon Gold potatoes from one of the planters. The leaves all gotten eaten by bugs at some point. 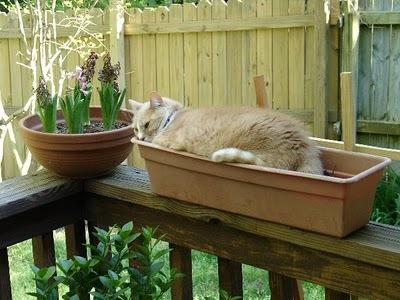 Ah, gardening. Curse you varmints. 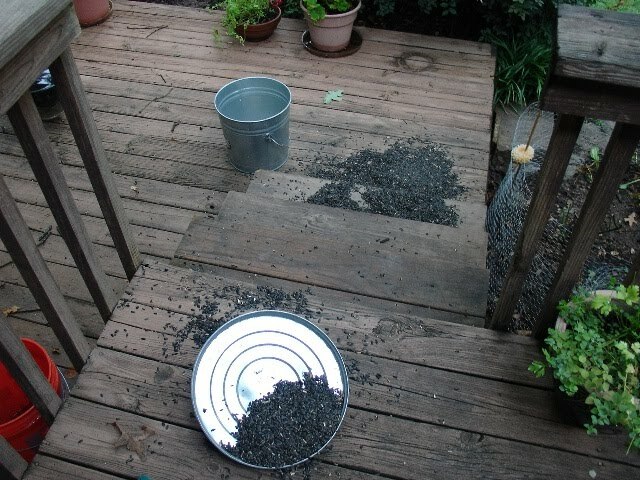 You know they eat raccoons in this state, right? Raccoons came to visit several times at the beginning of the summer, before someone got smart and took the birdseed to the garage. 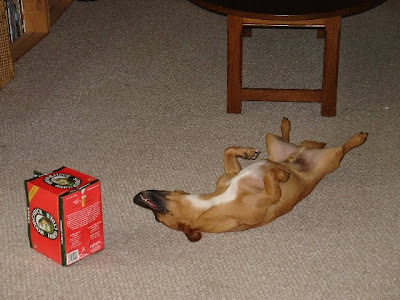 A pooped Miikka after a successful party. There are so many museums in Washington D.C. that you would have to be insane to try to see them all in one trip. We certainly made a valiant effort, but since we are not insane, we didn't get to more than a fraction. 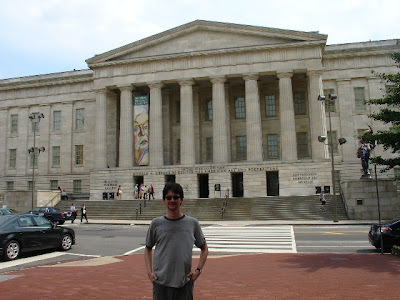 The first afternoon, we visited the National Portrait Gallery and Smithsonian American Art Museum (not to be confused with the National Gallery of Art, which we also visited later in the trip, or any of the other American Art or National Galleries in D.C.). We visited the excellent American Indian Museum...where I was too busy looking at exhibits to take many pictures. And we stopped in at the National Air and Space Museum. That place was jammed, mostly with parents and children. Planes and such are rather interesting for children - go figure. 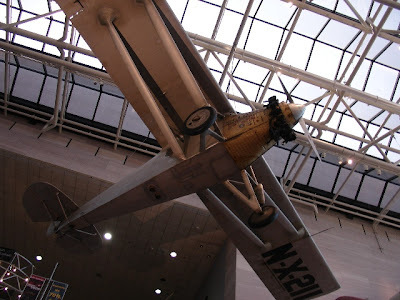 Anyway, we saw some of the museum, including the Spirit of St. Louis. What is so strange about that plane to me is that there is no window in the front. I couldn't get a good picture of it, but Lindbergh would have had to stick his head out the side door or something to actually see...something confirmed by the Wikipedia article about the plane. 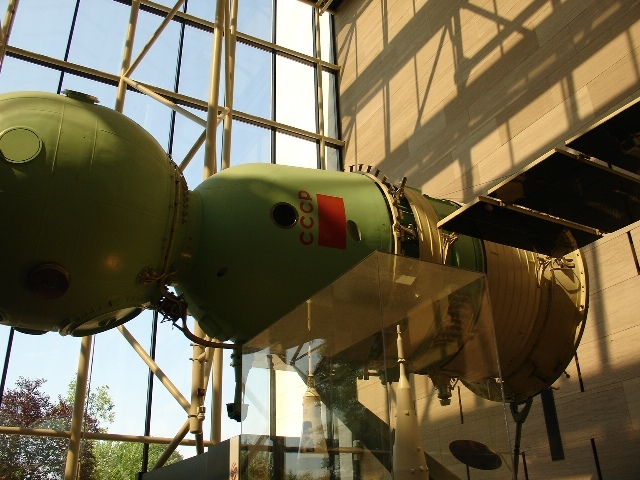 We also saw some of the space capsules and modules that were used in past space programs. It turns out that when they build the part that is going into space, they also build at least one back-up and/or training module. Those are what the museum has. So little! 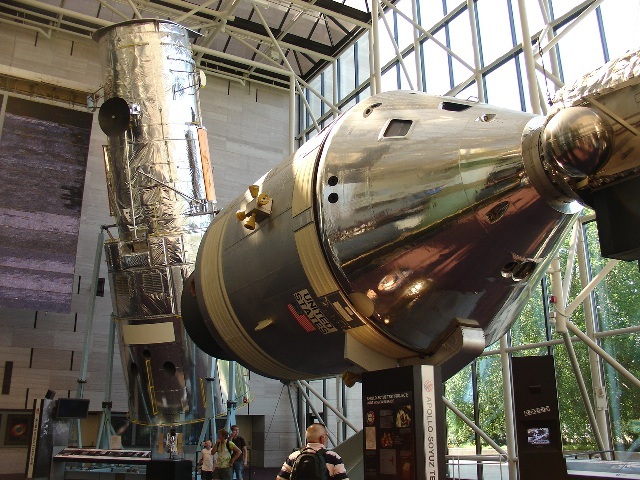 I think that my dreams of being an astronaut have been firmly squashed by the small size of the capsules and the design of the toilets (no pictures, sorry). This one reminds me an awful lot of the Starbug used on Red Dwarf. We didn't restrict ourselves to museums, of course. We also ate lots of good food. This was one of our favorite finds. A Mexican-style tapas restaurant. So very, very good. 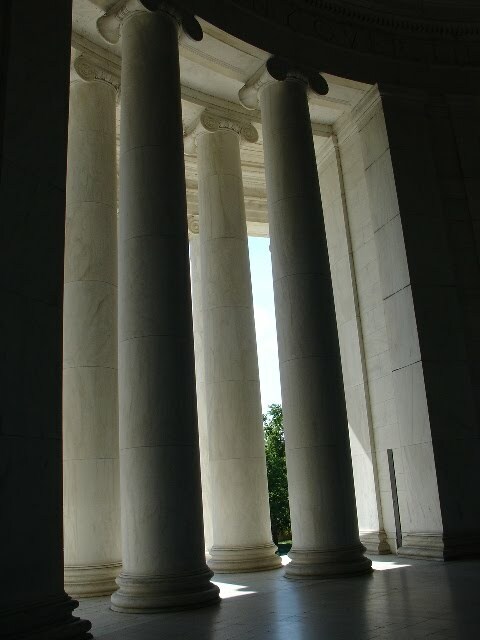 I love the building for the Jefferson Memorial, the Greek temple feeling, the way it sits across the Tidal Basin from the rest of the Mall area. Because it was so far on the other side of the Basin, I didn't get a chance to see it up close on my visit last year. 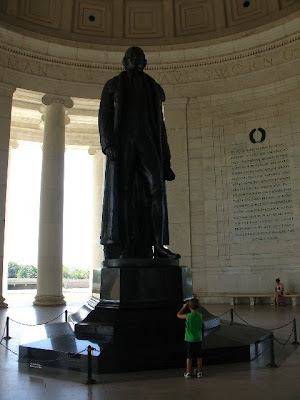 This trip, despite the heat and humidity, we made a point of walking around the Basin (and gobs of obstructionist construction) to see Jefferson. (I posted my Franklin and Jefferson posts out of order, since we actually saw Jefferson first, then walked through Franklin backwards, but oh well.) Up close, the building is, sad to say, a little less impressive. It seemed a little dingy, and smelled a bit like stale sewer water. Maybe that was just the heat, or the construction. The statue is impressively large, at any rate, and there are nice excerpts from Jefferson's writings on the walls. 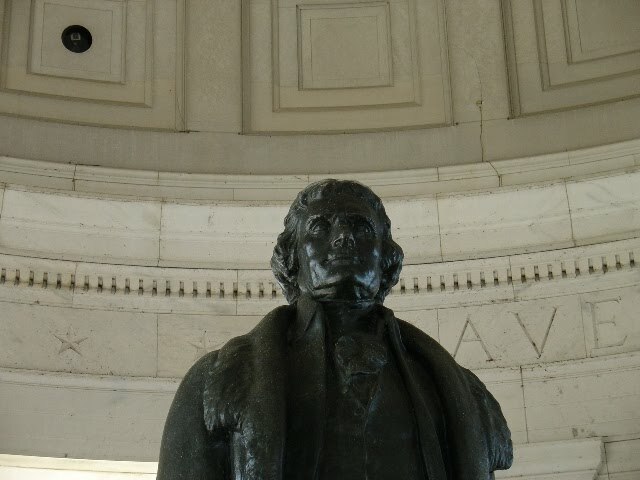 I can't say that Jefferson is my favorite president - I mean, I am incredibly impressed with everything he did and studied and invented, but somehow he just leaves me a bit cold. Perhaps a hangover from the semester I had to spend studying him and the movie Jefferson in Paris for a high school research paper? Anyway, I hope that his monument gets a good cleaning and a polish once the construction is done outside. And if a few more people learn something about democracy by visiting, then I am not going to be upset. But I'd recommend they take a trip to Franklin Roosevelt when they are done! 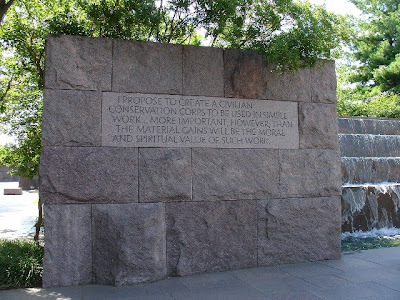 Of all the presidential memorials in D.C., I think the Franklin Roosevelt is my favorite - partially because of the monument itself, and partially because unlike the Jefferson and Lincoln monuments, it was not swarmed by people and yelling tweenagers. It is designed to feel like four different rooms, each representing one term. There are no steps, which makes it easily the most accessible for people in wheelchairs, or on crutches, or just with bum knees. Each room had lovely water features, quotes and statues. The shade was welcome, because even at 10:30 or 11 in the morning, it was hot. Eleanor only has this little nook, but at least she has that - I don't think any of the other presidential wives are mentioned at all. 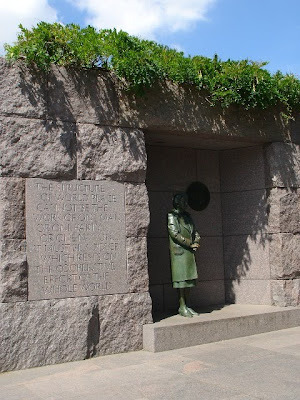 (Wikipedia says she is the only First Lady depicted in a memorial). We sure could use something as visionary as the CCC these days. 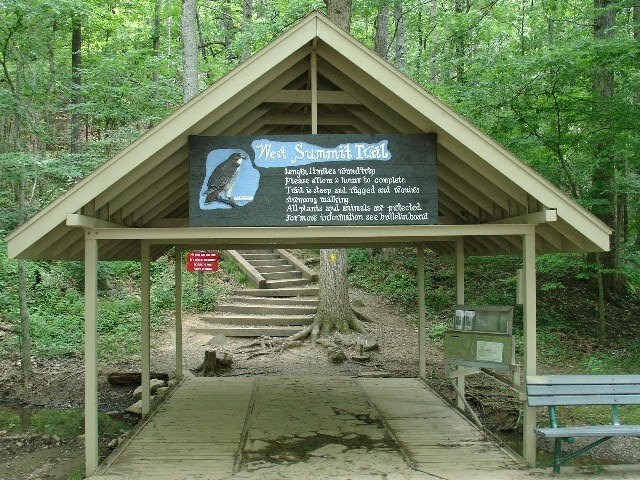 Every state park we have been to in Arkansas has some sort of notice to the effect that the trail was first cut by the CCC, or the lodge was built by the CCC, or the bridge was put in place by the CCC workers who had to lug each rock in over 5 miles of trail, by hand. You get the idea. They did great work, and it gave people hope and money in a time of national distress. Right out of a black and white picture - the breadline. At least we haven't fallen that far, yet. This statue was not in the original design, but I think it is great that it is there, even if Roosevelt was never pictured using a wheelchair. 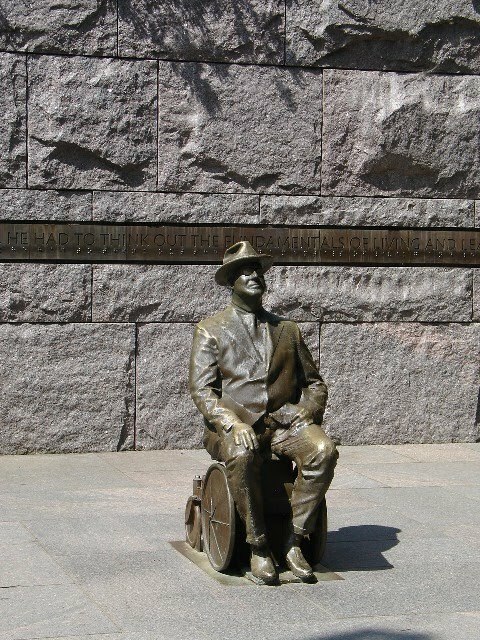 This statue was somewhat controversial because you can't tell that Roosevelt is in a wheelchair. Check the Wikipedia entry for more information about that. 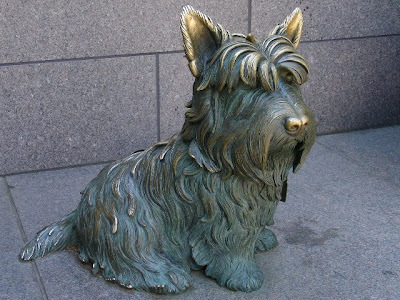 I don't care, one way or the other - it is just a nice statue. And it has Fala. You can tell that she has been well-loved by her shiny ears and nose. I had to give them a rub as well. 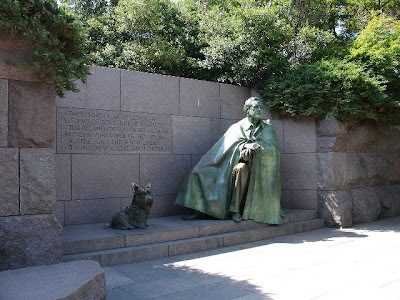 How great is that - a pet in a presidential monument? I mean, Lincoln liked cats, but all we get for him is a big august statue - nothing to make him human. Same with Jefferson. But Roosevelt, well, he gets Eleanor and Fala. The Statues of Washington D.C.
Good gracious me, D.C has tons of statues! They are everywhere - the traffic circle, in front of random buildings, at monuments, in front of museums, int he bathroom. Well, maybe not the latter, although, it really wouldn't surprise me. 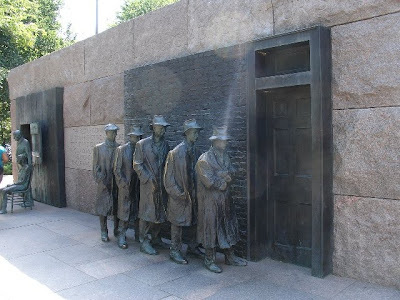 What casinos are to Las Vegas, statues are to D.C. (and I have seen slots in the bathrooms in Vegas!). Here are just a few of the statues we saw while we were there in June. 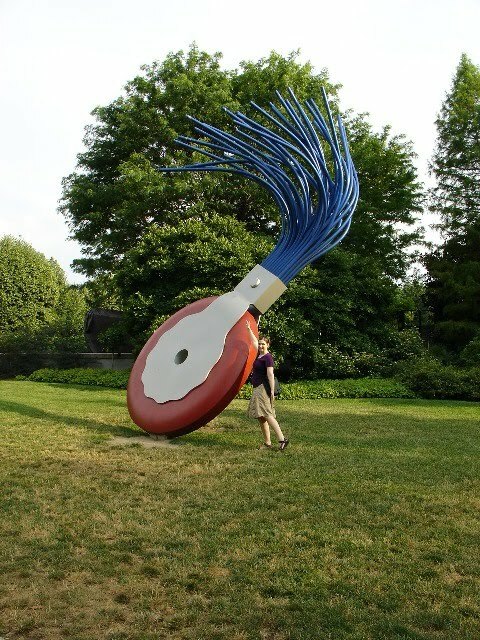 Yes, this one is inspired by the little brush/blowy thing that people used to use to clean out typewriters.. And look at how big it is. Just imagine the typewriter that would need it! 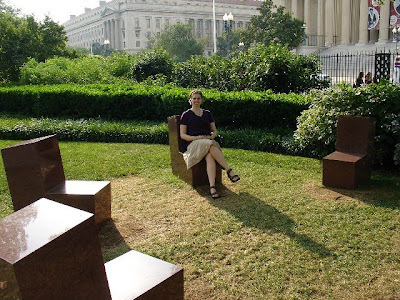 Most of the statues have little signs telling you not to touch, not to sit or climb on them, which is always sort of a bummer, even for grown-ups. This arrangement, on the other hand, specifically encouraged visitors to sit on the chairs. A nice rest on a very hot afternoon. Some sculptures were grave and thought-provoking, others were just plain goofy. 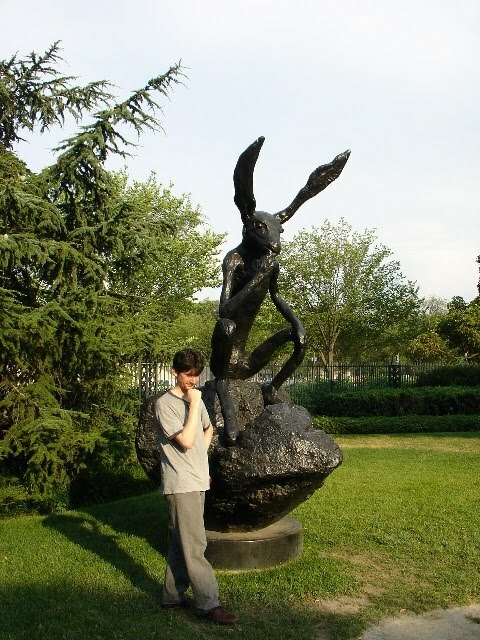 This set of statues were in the Sculpture Garden, which is part of the National Gallery of Art. 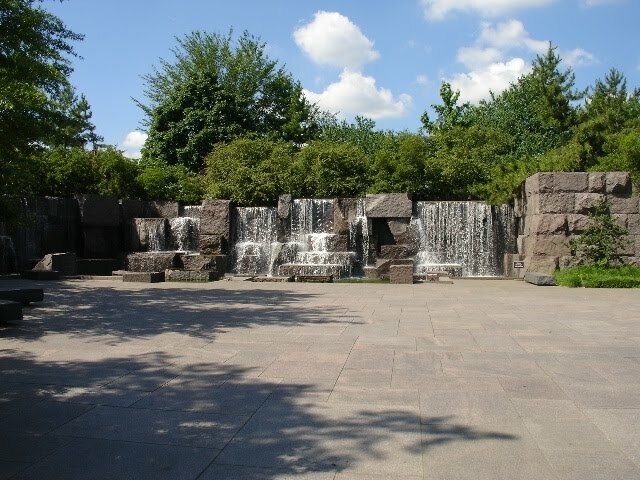 There were many more scattered throughout the garden area, just off the National Mall. 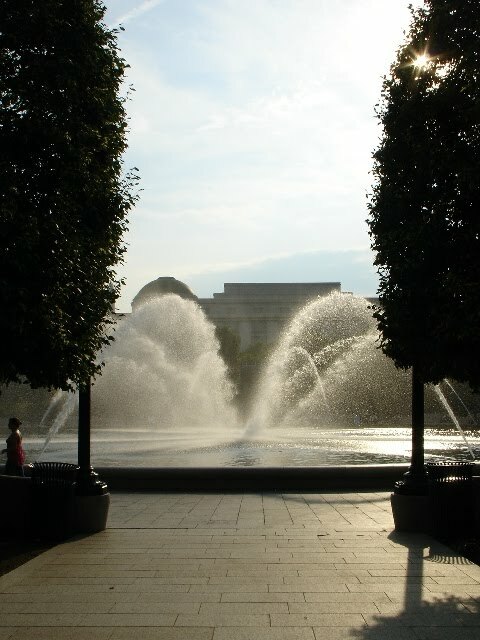 This fountain is at the center of the garden, and all around the rim, people sat and dipped their feet in the water. We joined in - did I mention it was a really hot day? 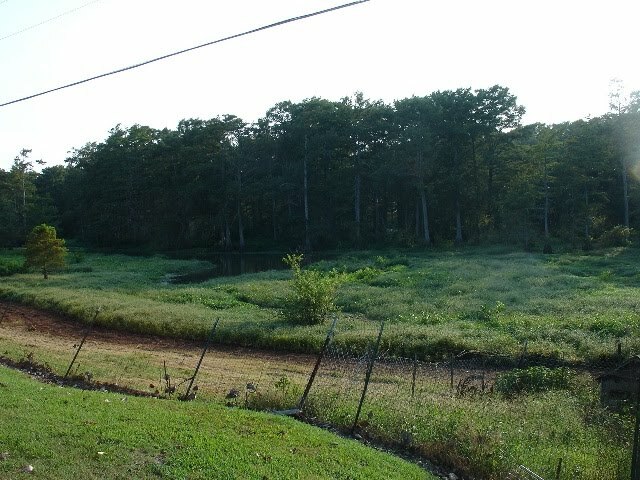 In the winter, this pond is converted to a skating rink. How neat is that? This is one of several statues outside the fantastic National Museum of the American Indian. 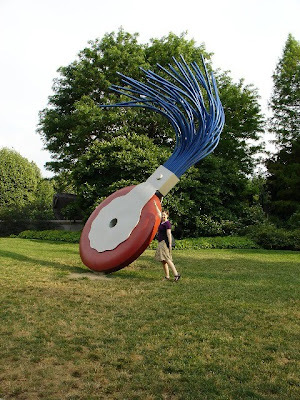 If you are in D.C. and have a chance, visit this museum. Eat at the cafe (it is pricey, but the food is mostly worth it - for the love of cultural diversity, just don't eat the chicken strips!) 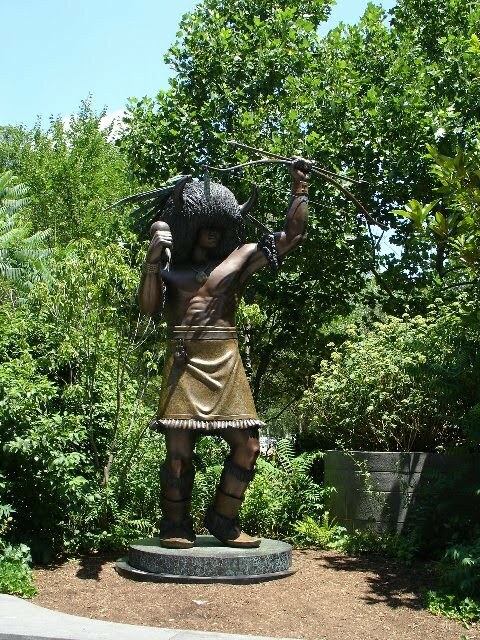 - it showcases Native American foods from all over the country and even South America. Watch the little introductory video and wander through the exhibits. Many thanks to Jeannette for pointing us in the direction of Albert here. 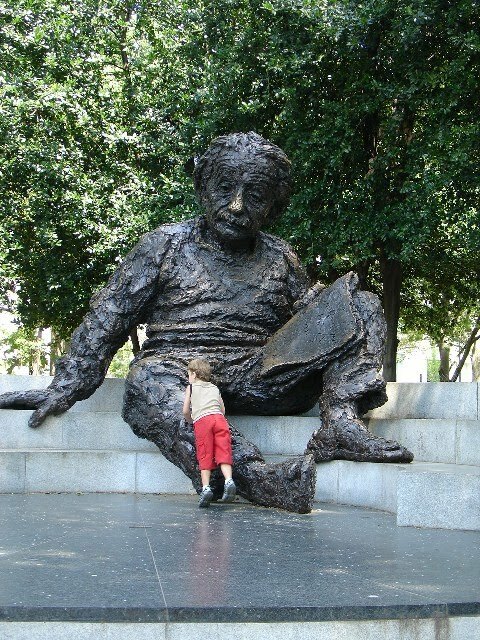 He sits in a little grove of trees outside the National Academy of Sciences. 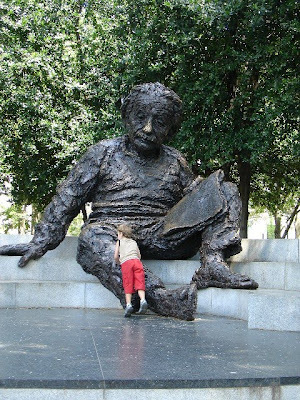 He was another statue that encouraged climbing (or at least didn't discourage it). In fact, it was rather difficult to get a picture of him alone, because a family with several children was visiting, and climbing all over him. If we had been alone, I might have climbed him myself, but I have too much dignity (err, was wearing a skirt that might have flashed innocent bystanders). What a pity. 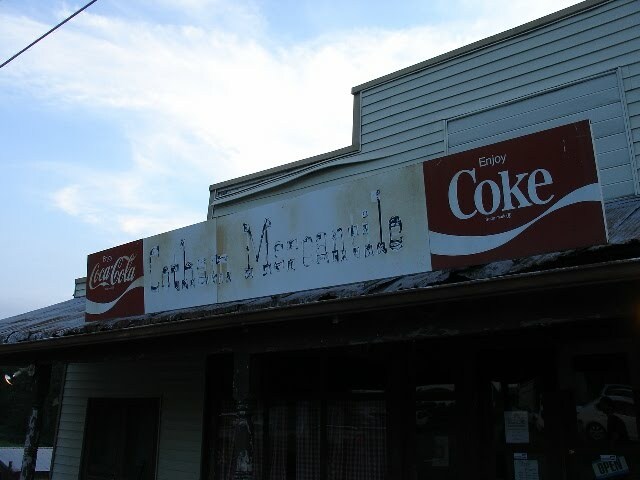 It says "Cotham Mercantile," I think. 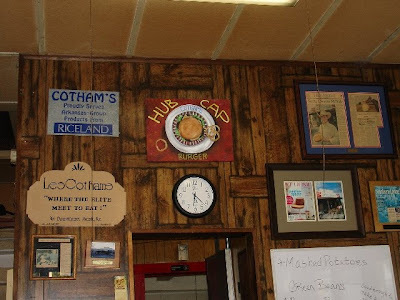 Saturday night we decided to have a little adventure (that is, we went somewhere we haven't been before, that was all of 30 minutes from our house) and visit the original Cotham's for dinner. It is on the direct opposite side of Little Rock from Maumelle, but thanks to the modern invention of the freeway, it only took us about 30 minutes to get there. Once you cross the Arkansas River, you are in an entirely different geological area - instead of hills and mountains, there are flat rolling plains and oxbow lakes, and this sort of bayou area (I checked with a native Louisianan to make sure I wasn't mischaracterizing it when I call it a bayou). Even the trees are different down there. It is sort of hard to tell from this picture, but that grassy area was fairly marshy, and the glint of white in the middle is water, a side branch of the river. This doesn't capture just how wobbly the place looks in person. 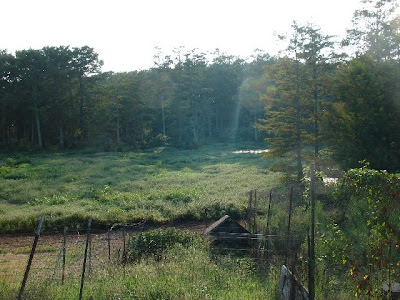 Cotham's sits out over that bayou on stilts. From the outside, it didn't look like it was stable enough to house a restaurant, and frankly, it was a place that we would have driven right past, assuming it to be an abandoned building, if we hadn't been warned. 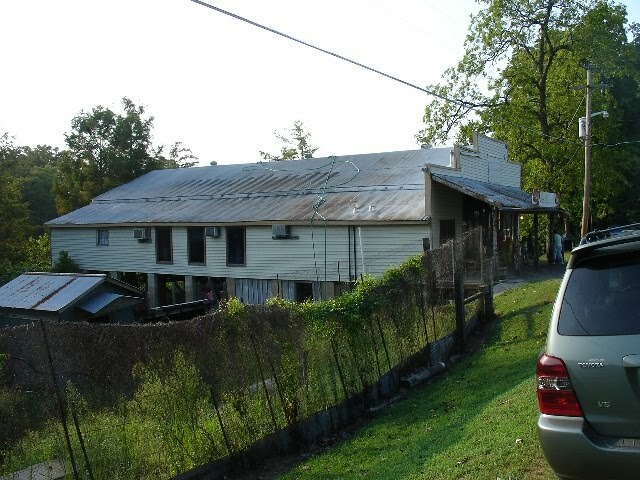 Apart from the people on the front porch and the parking lot full of cars, it really did look, umm, sketchy. The building was a mercantile store in its past life, and was made famous by Bill Clinton and other Arkansan politicians during campaign seasons past. Don't you just love that "paneling"? 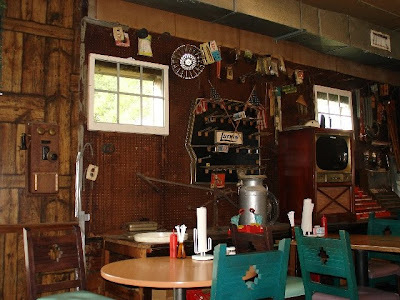 Inside, it is all fake wood paneling, left-overs from the mercantile store, and kitsch. That hub cap burger really was the size of a dinner plate - we saw several go by, but didn't dare try it ourselves. We could have shared one, if we had so desired. The rest of the menu is pretty standard Southern - fried chicken, chicken fried steak, and fried catfish. A rare moment when the tables weren't full. I went with the catfish. It came with hush puppies (my first real ones, I think), corn fritters, and onion rings. The only unfried part of the meal was the coleslaw, but since I don't really like coleslaw, I didn't eat much of that. The catfish was really good - not dried out and over cooked or anything - and the sides were tasty. The desserts looked pretty good, and included fried pies and a Mississippi Mud Pie, but Benjamin wasn't hungry enough for dessert, and I couldn't quite tackle one on my own, so we abstained. Shame. Now we will have to go back. Do you see that? We were hotter than Phoenix and Sedona. Maybe not today, since Phoenix is supposed to be around 110, and we are only supposed to be around 105, but that wouldn't make me sad. The weather report on the radio said that we got up to 107 for a little bit, which made it the hottest day in 10 years. Lucky us. I'd stop whining about the weather and talk about something else, if there was anything else going on here. Hmm, I guess I still have pictures from our trip to D.C. to post. Maybe tomorrow, if I haven't melted yet. 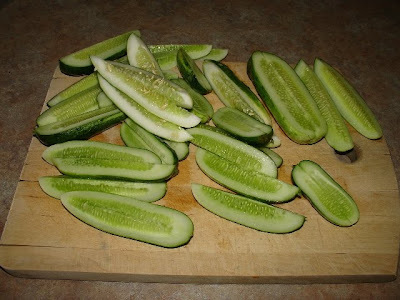 Earlier this summer, before it had been so hot for so long, I decided to try my hand at making pickles. I have canned various fruits and made applesauce and jams, but I have never made pickles. All the recipes I looked at seemed really easy, too easy even. I mean, surely it should be difficult? No? All I have to do is make a brine and put everything in the jars? Huh. Well then, let's give it a try. 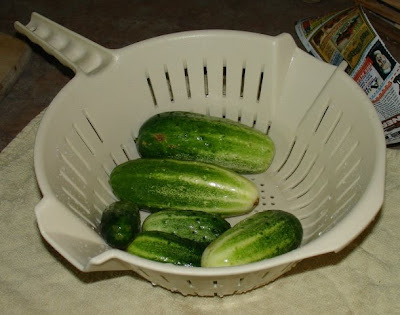 I used the dill pickle recipe from The Joy of Cooking (the 1960s or 1970s edition), with a few consultations of various web sites. The cucumbers are from the farmer's market, a variety specifically for canning and/or pickling. Since I like pickle spears and don't plan to eat them in sandwiches, I went with the spear shape. 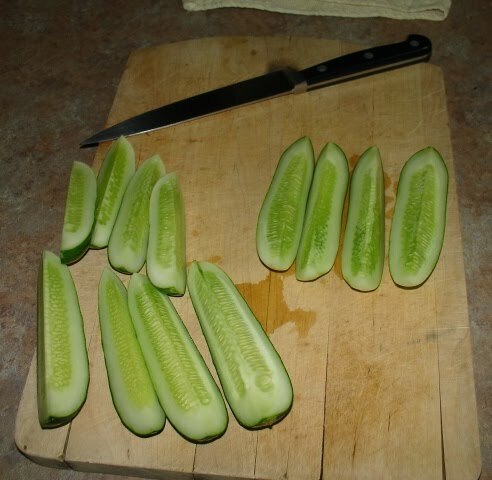 It was also the quickest - only 2 cuts per cuke. Some of the cucumbers did have to be cut in half because they were too tall for the pint jars, but again, not too difficult to prep. I had plenty of jars in the garage, left over from previous canning projects. I just needed to buy new lids - apparently, the little rubber seal only works once. 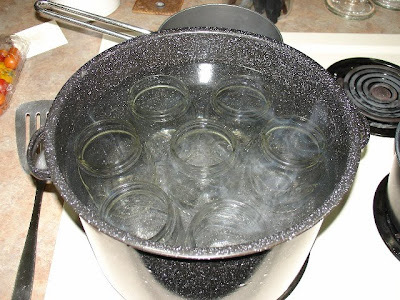 But, the jars did need sterilizing, since they had been sitting in the garage for a year or so. 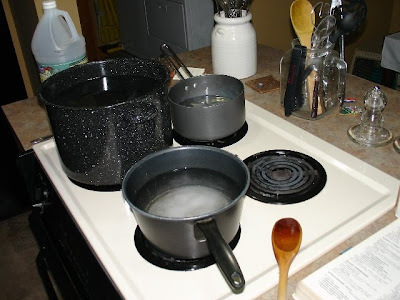 Look at that busy stove! The brine was really simple - pickling salt, vinegar, and water. Just boiled together. So simple. Too simple? 3 jars of pickles, whoo! Once the jars were filled with the brine and dill seeds and the lids were on, I re-boiled the jars. I think that step was sort of optional - if you are going to eat the pickles right away, they can just be stored in the fridge. 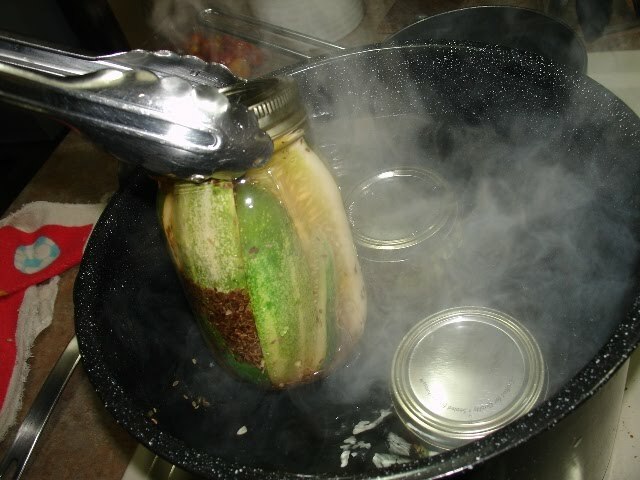 Since I was planning to store the pickles for longer, I boiled them. We haven't tried them yet - I think I am still not convinced that such and easy process is correct, or safe or something, but we will, soon enough.